Soo Liang is a qualified Naturopath and Nutritionist. He is an accredited member of the Australian Traditional Medicine Society (ATMS# 28417) since 2014. He currently practises at the Centre For Complementary & Alternative Medicine in Singapore. Soo Liang strongly believes in holistic healing and respects the Nature as the ultimate healer. His treatment approach centre around understanding the unique condition of each and every patient from physical, mental, emotional, and spiritual perspectives. He prescribes remedies, dietary advice, and lifestyle suggestion to address physical symptoms and emotional disturbances. He also encourages each patient to venture inward, to connect back the heart to uncover and address the mental and emotional blockages that manifested to become physical illnesses, in order to heal. 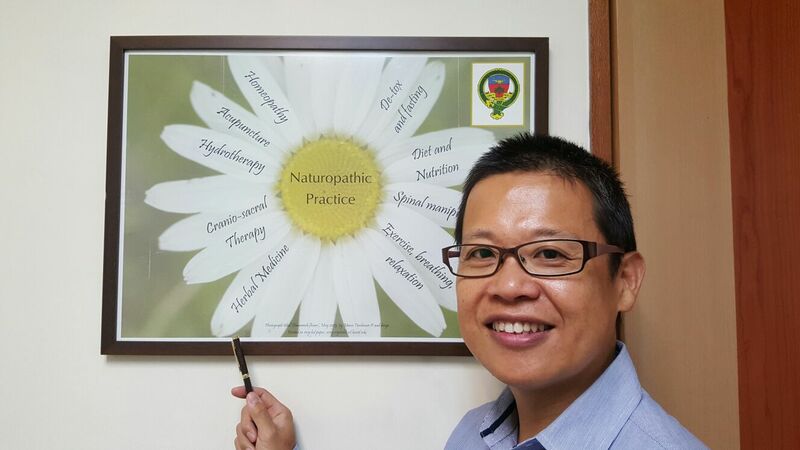 Notwithstanding to his holistic healing belief, Soo Liang also has a strong foundation in health science and supports evidence-based practice in natural medicine. Before venturing into the field of natural medicine, Soo Liang was a professional project manager with over 15 years of experience in IT and business consulting. He became a full-time caregiver for his wife who was diagnosed with breast cancer in 2011. By complementing the conventional treatment with lifestyle changes, healthy dieting, and natural remedies, his first patient returned to health with amazing results. Since then, he has devoted his time in promoting healthy lifestyle and to reach out to others to regain their health through natural medicine. Soo Liang holds an Advanced Diploma of Nutritional Medicine and an Advanced Diploma of Naturopathy from the Australian Institute of Applied Sciences, a Bachelor of Health Science in Complementary Medicine from Charles Sturt University, and a Master of Business Administration from the National University of Singapore. He is also a certified Level 3 practitioner of the Australian Bush Flower Essences. Soo Liang is also a plant-based nutrition specialist with a certificate from Cornell University, USA. Hear what other patients are saying…. My mom was admitted to the ICU in hospital on January 10, 2016 for acute pain in her abdomen. It turned out that her gall bladder was inflamed and she was operated on the next day. She remained in HDU for a number of days and upon full recovery, her liver function test for the next three months consistently showed her ALT and AST remained elevated. (Quoting the internet, AST (SGOT) and ALT (SGPT) are reasonably sensitive indicators of liver damage or injury from different types of diseases or conditions, and collectively they are termed liver tests or liver blood tests). She was not prescribed any medication during this time as the doctor wanted to monitor if the levels will reduce by itself. I discussed with Soo Liang and brought her in for a consultation on 18 May 2016. During the detailed consultation, he gave my mother a Zinc Tally test, and eventually prescribed her Zinc tablets and liquid herb. She also followed the diet that Soo Liang recommended, taking more nuts etc. Her liver function test taken the following week 24 May 2016 showed her AST and ALT have dropped although still high. She continued with the natural remedy for another cycle and her liver function test results came back normal by 16 August 2016! My mom has gained great confidence in complementary medicine and is now more careful with her diet after hearing from Soo Liang. In fact she shares her experience with her friends and we both highly recommend a visit! During my cancer treatment, Soo Liang’s advice was absolutely invaluable in ensuring that the side effects from my chemotherapy and associated drugs were minimised. Soo Liang’s compassionate and considered approach allowed for a very tailored regimen, which was adapted well to my changing needs during and post my treatment. The natural herbs and remedies which Soo Liang prescribed was very effective and a welcome relief in the midst of all the hard drugs from my intensive 3 month chemo regime. I greatly appreciated Soo Liang’s kind and caring manner, and his passion for wanting to achieve the best outcome for his patients. When I was diagnosed with SLE 3 years, it was a blessing that I had Mr. Ooi to support me during my difficult times. Based on my condition, he gave me a diet plan derived all from natural foods and some supplements with natural ingredients. I was advised what type of food to avoid. I was also advised to change my lifestyle, start exercising, and learn to treasure my life. Today, I am on minimal medication and able to enjoy my involvement in social works. Praise God for all the natural resources that He has given, and thankful to Soo Liang for guiding me back through natural treatment. Thank you so much for being there for me when I wasn’t well. Now I am much better, feeling good and happy. I have learnt to eat healthily and takes regular walks. You are an exemplary practitioner, very disciplined and knowledgeable. Appreciate your consistency and dedication. Always dispensing practical solutions in all aspects. Your concern and care cause one not to be able to be careless and negligent of one’s health. May you be able to help more people. Ooi, S. L. & Pak, S. C. (2019). Short-term intermittent fasting for weight loss – A case report. Cureus. 11(4), e4482. doi: 10.7759/cureus.4482 . Ooi, S. L., Correa, D., & Pak, S. C. (2019). Probiotics, prebiotics, and low FODMAP diet for irritable bowel syndrome – What is the current evidence? Complementary Therapies in Medicine. 43, 73-80. doi: 10.1016/j.ctim.2019.01.010 . Ooi, S. L., & Pak, S. C. (2017). Serenoa repens (saw palmetto) for lower urinary tract symptoms/benign prostatic hyperplasia: Current evidence and its clinical implications in naturopathic medicine. The Journal of Alternative and Complementary Medicine, 23 (8), 599-606. doi:10.1089/acm.2016.0302.